If you are getting a lower denture reline than it is the perfect time to add our lower denture stabilizers. 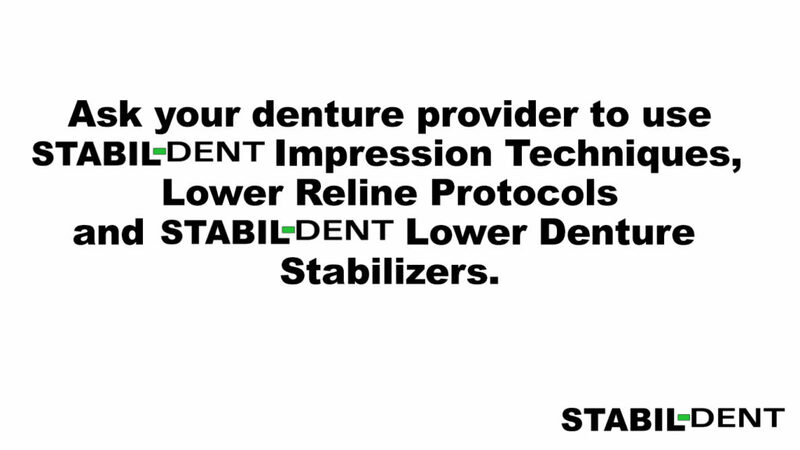 Stabil-Dent Lower Denture Stabilizers and a correctly relined lower denture are the combination needed to stabilize your problem lower denture. What we are hearing from our patients though, is that it is getting harder and harder to get a proper reline done. Acquiring a secure and comfortable upper/lower denture is not as assured as one would like to assume. The results of a poorly provided reline are what creates a large segment of denture problems. Even if you aren’t a Stabil-Dent user, this information will help you get the most from your denture provider when you decide it is time to get a reline. Why get a reline in the first place? Your denture was made to fit your oral tissues and nobody else’s. However, your oral tissues change over time, just like the rest of your body. Therefore, when your denture starts feeling loose, it is a sign that your oral tissues are changing. Many denture wearers decide on a reline but unfortunately, are let down by the inadequacies of the reline. Too many denture providers lack proper education, training and experience to adequately provide these essential services. There are no set intervals on when to get a reline, changes in your oral tissues will let you know when the time is right. Getting a secure and comfortable lower denture is what gives most people problems. A lower denture reline follows a very different protocol than an upper reline because the lower denture is the denture that does all of the work. It moves left and right, up and down, and side to side. Whichever way your jaw moves, so does your lower denture while your upper denture just sits in place. A reline begins with an impression and there are two very different types of reline impressions; static and functional. 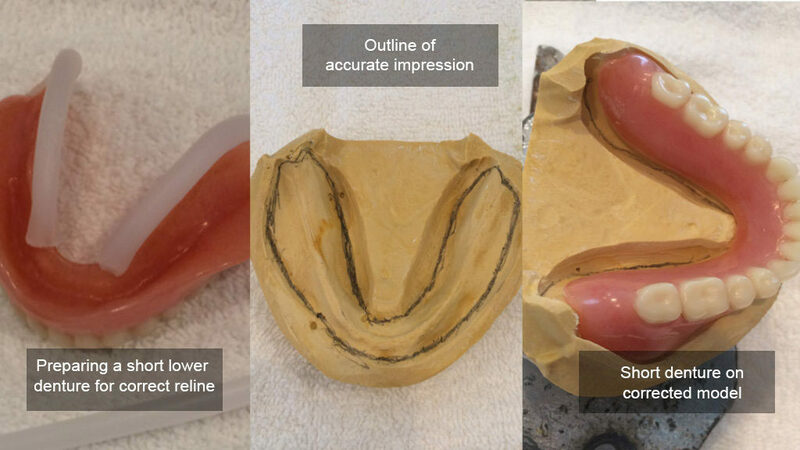 We can not stress enough, an accurate impression is the foundation of getting an appropriate reline. If the impressions are not accurate, the reline will not be accurate. It is that simple. A static impression is taken when you sit in the dental chair and your impression is taken by the dentist, dental assistant or denturist and this impression takes an imprint of your tissues but importantly not as they are working and supporting the lower denture. Hence the term “static”. The second type of reline impression is called a functional impression. The dentist / denturist will place a special impression material in the denture and have you wear the denture for 8 – 24 hours. This impression material actually moves [ever so slightly] as your tissues move during all of your speaking, swallowing and eating activities. This is why it is termed “functional”. A functional impression will show pressure spots which to the denture wearer are sore spots. These are removed by the dentist or denturist and a covering of the functional impression material placed over this or these spots only. Then worn again for 8 – 24 hours. When all of the sore areas are gone; then and only then is the lower denture ready to reline. 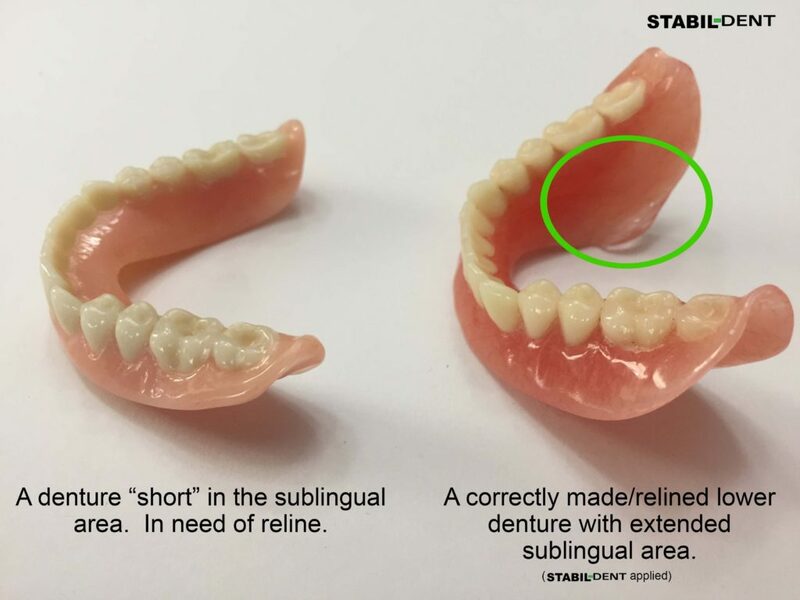 Stabil-Dent believes denture wearers should only have functional relines performed as static relines will not reveal all the problem areas of the denture. Denture wearers need to be aware of 1 or 2 hour reline services. These are not functional impression relines and are often called “chair side” relines. Reline material is mixed and is inserted between the denture and the patient’s oral tissues and this material fills the gaps it finds and becomes part of the denture, theoretically relining it. We cannot stress enough to stay away from chair side relines. They are not accurate and we can guarantee you will not be satisfied with the results. The old adage, “You get what you pay for” is very appropriate here. What Is the Best Do It Yourself Reline Kit? There isn’t one and there is a real chance to ruin your denture. These are basically chair side relines that you do yourself. To reach the all important sublingual area (see below) you need either border molding compound/wax; neither are supplied in these kits. The major draw back is the material used basically welds to your denture. If you get the reline wrong and the fit is not correct your denture provider may say you need a new denture. They are simply a waste of your time and money. Sublingual: What is it and why is it important? The picture above is an easy way to see if your lower denture is made/relined properly to fit into the sublingual area of your lower denture. This is the area on the tongue side, down deep and back towards the throat and jaw. This is the only area in the mouth, that the tongue and swallowing muscles apply pressure in a downward/sideways motion. This motion provides the natural pressures to help your lower denture stay in place, as these are the muscles that create the pressure on our Stabil-Dent Denture Stabilizers. Most dentures are made short in this area, thus not utilizing these natural muscle movements. If a denture is made short, the muscles and/or tongue will go under the tongue-side edge of the denture and cause the denture to lift and move around. Having a denture that covers the sublingual area of the mouth is crucial to a properly fitting lower denture. Adding Stabil-Dent to that same relined denture will provide a stabilized lower denture. What you need to remember about soft relines is that they are masking another problem with your lower denture. Soft relines and/or liners are generally utilized when a dentist cannot get the occlusal contacts correct. In-other-words, the teeth are not coming together at the same time. One side hits first or harder than the other, thus, creating pressure sore areas. A soft liner will help reduce this problem but then creates another. Because the material is soft, it has microscopic holes in the material which will hold bacteria not good. There are simply put, very few individuals actually need soft liners. The vast majority only need to have their dentures made by a dental professional who knows how to establish Centric. Centric is the position where all of the teeth come together at the same time. Denture wearers generally have fewer issues with upper dentures as they are held in by suction. An upper denture is held in place by a ‘Post Dam” area, the junction of the hard-palatal bone with the soft throat tissues. This ‘Post Dam’ area creates a positive pressure area created on the model of your mouth when a reline impression is sent to the dental laboratory. A chair side reline, one that cures in your mouth or is completed in 1 or 2 hours, will lack this important ‘Post Dam’ area. Additionally, the edges of the denture need to be recreated to fit the functional movements of the oral tissues under usage. Again, this cannot be established doing a chair side reline. Some practitioners will tell you that they can achieve these functional edges of your dentures but generally speaking, they cannot. How do I get the best impression and reline? It isn’t easy. Educate yourself and ask questions. There will be no menu showing you what type of reline or impression technique your denture provider is using. We suggest using the knowledge provided here, asking questions of the process and simply paying attention to time. If your reline will be performed in a couple of hours, then it is probably a chair side reline which we suggest avoiding. If the reline will take a a couple of days it is most likely a clinical reline sent out to a dental laboratory and you should be much happier with the results.